I had no clue what the Spanish part meant until today. Makenzie's PT, who speaks spanish told me it meant God go with us .... or something really close to that effect. Why you ask does this matter... Well we are planing to go to Costa Rica for Stem Cell Therapy!!! This is Big!!! One of the biggest decisions We have had to make! I have been researching this for almost a year!!! There are so many different opinions on this and how to do it and if it works. Like I have said before ... there are no promises made by any of these clinics..... however I have seen it work!!! I am not going to write a long research paper for you.. sorry my life is to crazy and that would take hours! I will say one big thing and that is ... these cells are taken from the cord blood of newBORN babies. There is nothing or no one hurt in the process of collecting and preparing the stem cells for transplant! I have eliminated all of the cons of this therapy other then the cost. With that said we are going to trust that one way or the other God will provide! He has spoken to me very clearly on ALL of this in the last week! The deal I made with myself was that I was going to wait until we had reached the 2 year mark to seriously consider SCT and here we are!!!! We are going to shoot to go in July. We will be there for about a week and are going to go with Makenzie's 3 year old boyfriend Charlie! (he is going for round 2... round one worked so well his family is taking him back!) With possibility of possibly one or 2 more young brain injury victims also joining us!I have a suit therapy session scheduled in CA in July that I think we will have to postpone. If we are going to do Stem Cells it makes more since to do the cells before another expensive therapy. If we wait until the fall we will be able to start using any new skills Makenzie gets from this in the intensive therapy.... God Willing and only if it is for His Glory! The worst that could happen is nothing! As a mom I know that that too is possible! As a mom I will also not leave any stone that I can pick up unturned!!!! I do not want to look back 20 years from now and wonder what if! 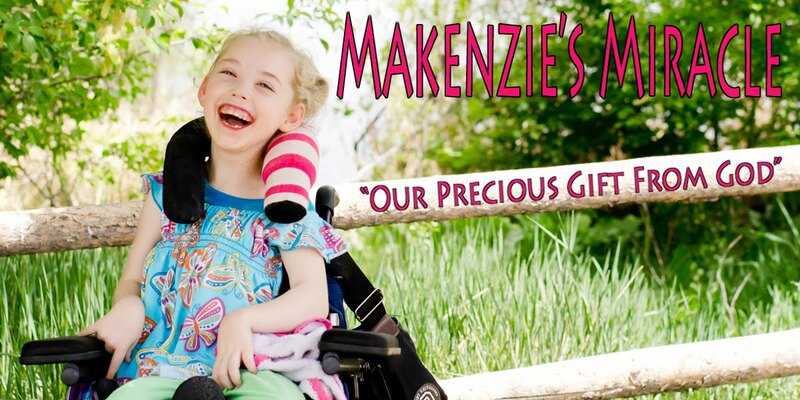 Anything that I spend that kind of money on will long be forgotten by then but if Stem Cells gives Makenzie a better life that will never be forgotten!!! I am sure some of you... including my family and closest friends are sighing very loudly right now and are wondering when I am ever going to stop all of this... well... the answer is NEVER!!! And if you are one of those skeptical people, that is totally ok! I do not ask that you understand or even agree!!! Until you walk in the shoes of caring 24 hours a day for a child... YOUR CHILD.... that can not do the things they want or need to do, you can not possibly get it!!! I love you all anyways!!!!! LOL! I thank you for all of your love, support, and prayers most of all! God is in this. Many years ago he had me standing in a studio with my classmates signing.... Costa Rica.... God go with us!!! God will go with us to COSTA RICA!!! God speaks to us. We just need to learn how to listen! Thank You all so much!!!!! God Bless, Pam! p.s. many, many more details to follow!!! p.p.s please feel free to use the guest book or my e mail to ask any questions! I will do the best i can to answer them! !